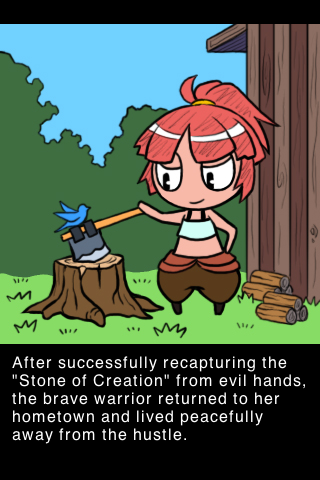 Sometimes, a game has such an amazingly simple and effective mechanic that you wonder why you didn’t come up with it. 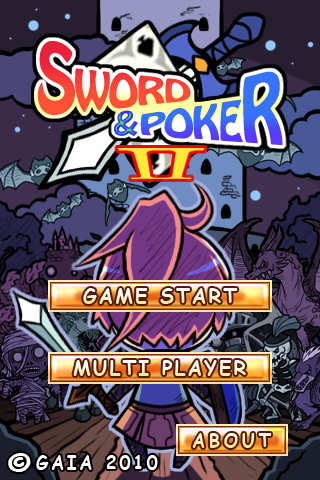 Sword vs Poker is an example of one of these games. It can loosely be called a “puzzle-adventure” game (or, as if often the case with iPhone games, it really fits into the “timewaster” genre), where the core game mechanic is about using poker hands to defeat monsters. So far so surreal. It opens, promisingly (?) with: “this is a story of a magical world based on cards.” It’s not exactly the greatest start to a game I’ve heard, and things take a turn for the worse when you see that the entire UI is done in Comic Sans. But it’s endemic of the biggest problem with this game – the gameplay is fine, but it was assembled by people with some of the worst taste and sense of design in the entire world. Hottest female (?) lead ever? Hell yes. The game starts with your nameless hero (who you don’t care about in the slightest) coming up with some (meaningless) justification to fight off the (equally irrelevant) main antagonist and all his minions. Seriously, I don’t even remember who I’m fighting or why. The cutscene you have to sit through sadly isn’t really skippable and suffers from the wall of nonsense text phenomenon (much like this blog, let’s be honest), as well as the our ‘artists’ use MS-Paint syndrome. Thankfully, the creators of the game also probably realized that story and writing was never going to be their strong point, and you are mercifully dropped into the actual game component and pretty much left alone. 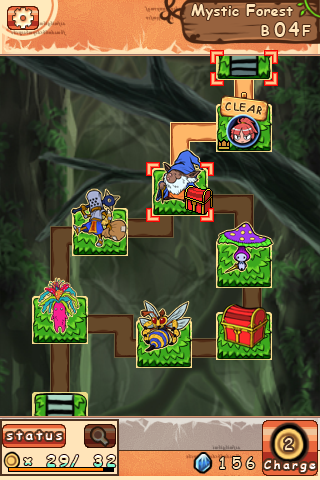 The level map consists of a bunch of badly drawn monster graphics linked by a preset path. They didn’t make it a dungeon crawler, it’s just a series of discrete battles. Monsters have varying amounts of health coins and different special attacks (e.g., some monsters can make you skip your turn when they play a full house), and you wander around defeating them in turn by playing poker hands. When in battle, you are presented by a 5×5 grid of cards, the middle 9 cards are pre-dealt. 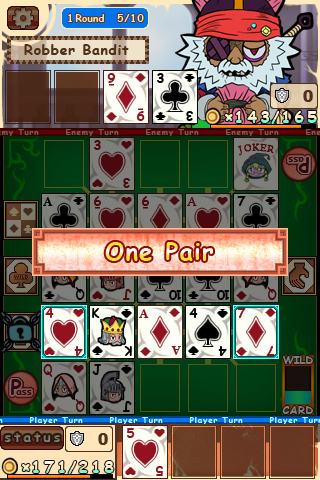 You can create a poker hand out of the currently placed cards and two of the four cards in your hand by making a straight line. Any of the cards in that line are used to decide what hand you made, and from that, the damage and any special abilities of your weapon. Like I said, it’s amazingly simple, but it’s incredibly solid. Anthony Hopkins really let himself go. Things are mixed up a bit by equipping you (and the monsters) with different weapons, shields, and even magical powers that can drastically alter the game flow. It’s fairly well conceived, although (and perhaps I am just playing it wrong), I find that about 70% of the magic and over half the weapons are pretty much useless. The weapons that heal you or paralyse the enemy are all you’ll ever need, and I went through the game using about 4 of the 12-odd available spells. That said, the variation is largely irrelevant; each battle is pretty much equally fun once the magical abilities are unlocked. In fact, that is the game’s great issue, everything, from the small enemies to the boss battles, is basically just a repeat, made different by the random dealing of cards. Indeed, the entire second game is basically just more of the first, hell, most of the spells and equipment were just copied over. Nevertheless, I have clocked god knows how many hours in this game. It’s perfect for playing absent-mindedly on the train or while waiting for, well, anything really. Both games are good but the second is both longer and more feature rich. I haven’t encountered any real bugs with it except for some occasional sound stuttering, and I can quite happily recommend it for people looking for something to fill the gaps in their day. Oh, and the music is rubbish — it is the Comic Sans equivalent of the Final Fantasy V soundtrack. As an iPhone game, I regard this as a good and worthwhile purchase. It’s not terribly polished, but it’s a reasonable execution of a great (if simple) idea. I’m a bit bemused at how you arrived at the 55% figure in the end. It doesn’t seem to bear any relation to the other numbers, unless gameplay is weighted to be 90% of the total or something..
A game is more than the mere sum of its parts – and above that, I reserve the right to provide a “tilt” score to adjust the final mark. In the case of iPhone games, we have to account for the differing expectations of it as a platform. Another thing to note – I regard “50%” to be “average”; and by my rating, this is an above average game – taken from the perspective of what you want as a timewaster during, say, travelling to and from work.